We are a leading Manufacturer of solar ajb, solar array junction box, solar combiner box, pv array junction box, solar pv array junction box and solar electrical junction box from Noida, India. To meet the precise requirements of our customers, we are involved in presenting an extensive quality range of Solar AJB to our customers. The capacity of Solar Arrays is indirectly related to the exposed surface area of the arranged solar modules. Number of strings makes an end to end connection with Combiner boxes (Solar Array Junction Boxes) and the main solar modules. 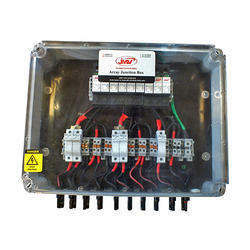 Solar Array Junction Boxes are equipped as an enclosure to the electrically connected strings and the electronic devices & a safeguard to the DC side. 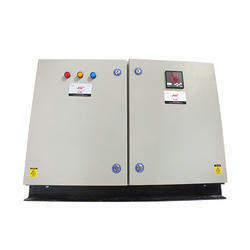 We are the leading manufacturer and supplier of Solar Combiner Box. These are manufactured from latest technology and high grade material. Application Solar power applications rated 600 to 1000 volt dc, assembled in poly carbonate box. 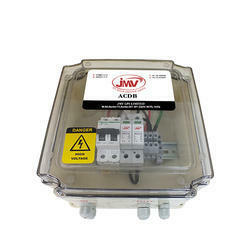 We are the leading manufacturer, supplier and exporter of PVArray Junction Box from India, These are manufactured from state of the art technology and high grade material. These are customized as per the clients requirement and meet all national and international standards. These are supplied in bulk quantity and at competitive rates. 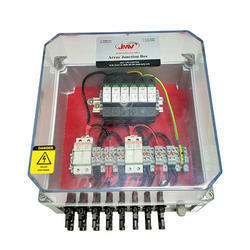 Being the leading names in the industry, we are involved in offering a wide range of Solar PV Array Junction Box. 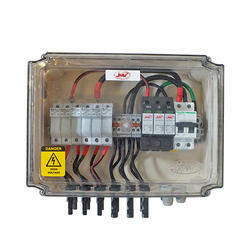 We are the leading manufacturer, supplier and exporter of Solar Electrical Junction Box from India, These are manufactured from state of the art technology and high grade material. These are customized as per the clients requirement and meet all national and international standards. These are supplied in bulk quantity and at competitive rates. Looking for Solar Array Junction Box ?